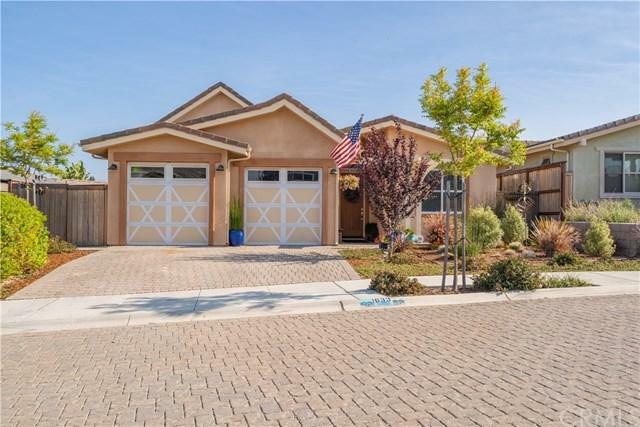 Live Green with style in the like minded community of Green Park in Grover Beach. The home is eco-friendly with several green amenities that will lower living costs dramatically. There is a Lennox Hearth Natural Gas Fireplace, 3.12 kW photovoltaic Solar System that is prepaid for the next 16 years, tankless water heater, Milgard dual pane low E glass windows and sliders, and polished stained concrete flooring with in-floor radiant heating to keep the house cozy. This single level Farmhouse/Craftsman style home has 1664 sf with 3 bedrooms and 2.5 bathrooms. There is a soaring ceiling in the kitchen/great room with many windows for an elegant light and bright feel. The master bedroom has coffered ceiling and slider to the yard while the luxurious Master bath features, granite slab counters, travertine, dual sinks and a walk-in closet. The gourmet kitchen features Granite countertops, custom cabinets with soft close, ston backsplash and an island with seating. The list goes on and on. Sold by Melissa Layshot of Hubbell Real Estate Group.